Is the American Foxhound right for you? Find your perfect match now! American Foxhounds were a fixture in the southern colonies: these dogs lived in Maryland and Virginia as far back as the early 18th century. 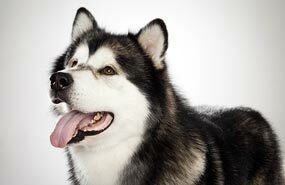 The breed is native to America; in fact, it's one of the nation's rarest native breeds. Born to hunt, these high-energy dogs run 'til they drop, become rowdy when bored, and sing with a voice only a mother could love. This large breed can grow to between 60 and 70 pounds and live 11-13 years. The breed is recognized by the American Kennel Club and classified as a member of the Hound group. WHAT IS AN AMERICAN FOXHOUND'S PERSONALITY LIKE? A well-exercised American Foxhound has a lovely temperament and is relatively laid-back, though some can have a stubborn streak. This breed is almost everyone's best buddy: they get along swimmingly with other dogs, other pets (even some cats! ), and children, though some are wary of strangers. American Foxhounds are not usually very affectionate, but they're easygoing housemates when their exercise needs are met. WHAT IS AMERICAN FOXHOUND BEHAVIOR LIKE? American Foxhounds are fairly playful dogs and very vigilant though not particularly protective. They're somewhat prone to barking, or, to be more accurate, baying. HOW EASY IS IT TO TRAIN AN AMERICAN FOXHOUND? The American Foxhound is a somewhat biddable dog, reasonably smart, and easily trained. Start early and be consistent—you'll need to manage this dog's tunnel vision when it sights prey. HOW MUCH DO AMERICAN FOXHOUNDS SHED AND WHAT ARE THEIR GROOMING NEEDS? 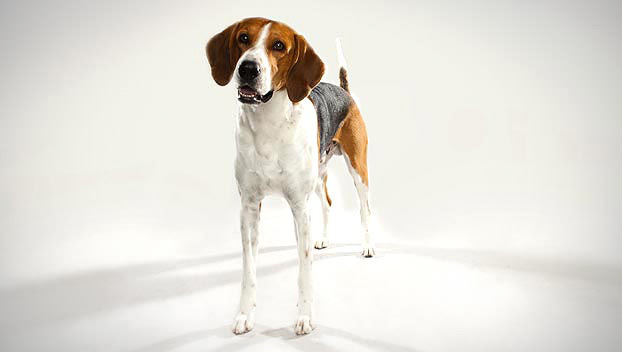 Dog coats don't get much more low maintenance than this—American Foxhound's short hair doesn't shed much at all, so they can get by with only occasional trips to the groomers. Keep those adorable floppy ears clean — it's dark and moist under there, which can cultivate bacteria that can cause ear infections. WHAT HEALTH PROBLEMS DO AMERICAN FOXHOUNDS HAVE? By and large, this is a hardy and healthy breed. As noted above, those low-dragging ears can be prone to bacterial infection. Some suffer from thrombocytopathy, which can cause minor scrapes to bleed excessively. American Foxhounds can sometimes develop hip dysplasia. Feeding your baby American Foxhound a growth food for large-breed puppies may slow their rate of growth but not diminish their adult stature which may help prevent or reduce the impact of adult-onset hip dysplasia. ARE AMERICAN FOXHOUNDS GOOD FOR PEOPLE WITH ALLERGIES? The American Kennel Club doesn't list American Foxhounds among its breeds recommended for allergy sufferers. You can reduce your furry friend's impact on your allergies with frequent baths and brushings to reduce loose hairs and allergy-aggravating proteins in your pet's dander. Use a damp cloth to wipe off your dog after playing outside. Smaller dogs have less surface area, so they produce comparatively less dander than larger breeds — definitely something to keep in mind with a dog as large as an American Foxhound! Remember that no breed is 100% hypoallergenic, and any breed can aggravate allergies. WHAT'S AN AMERICAN FOXHOUND'S BEST DAY? Spending the day running around a snowy backyard with a white toy to fetch followed by a quiet evening in a warm dog bed would keep her heart overflowing with joy! SHOULD I ADOPT AN AMERICAN FOXHOUND? Don't make an American Foxhound your New Year's Resolution-to-Exercise-More dog or you'll pave a road to chewed furniture with your good intentions. This breed needs a ton of exercise and can be destructive or mopey if she doesn't get it. An American Foxhound is neither a fashion plate, nor a city dweller. He needs room to run and things to chase and a family who doesn't mind his reticence toward public displays of affection. This breed is suited for both warm and cold climates; your local weather matters much less than your willingness to let this dog run. American Foxhounds need very active families. If you can make sure your American Foxhound has plenty of space to stretch its legs and you're looking for a canine companion who won't smother you but gets along with everybody in your household, you and the American Foxhound just might be the best of friends. Have you decided that an American Foxhound is the perfect dog for you? Why not be your new best friend's hero and adopt a rescue! Be sure to check out our article on what to expect when you're adopting a dog or cat.